Ruben Mosqueda The likelihood that you haven’t heard of THE NIGHT FLIGHT ORCHESTRA is relatively high. The fact that the band features SOILWORK frontman Bjorn ‘Speed’ Strid and ARCH ENEMY/SPIRITUAL BEGGARS/MERCYFUL FATE bassist Sharlee D’Angelo has KNAC.COM readers think, these guys have some pedigrees in ‘heaviness’. Naturally you’d think the music would reflect their previous work, such is not the case here. THE NIGHT FLIGHT ORCHESTRA was formed in 2007 by ‘Speed’ and guitarist David Andersson. They were soon joined by D’Angelo. THE NIGHT FLIGHT ORCHESTRA has gone on to write, record and release previous three albums; Internal Affairs in 2012, Skyline Whispers in 2015 and 2017’s Amber Galactic. The aforementioned is an outstanding space rock/progressive rock record. On Amber Galactic, you’ll hear KISS, DEEP PURPLE, RUSH, STYX, SUPERTRAMP and REO SPEEDWAGON amongst others. The result is a fantastic pedal to the metal melodic rock tour de force. 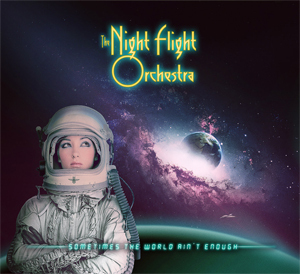 THE NIGHT FLIGHT ORCHESTRA wear their influences on their sleeves; anything and everything classic rock from the ’70s through the ’80s and they do so with great success. Having said that Internal Affairs was a top-notch album and one of the best of 2017. My initial concern was this this album was perhaps written too quickly and NFO could have taken a little more time to write the follow up. Sometimes The World Ain’t Enough or any follow up to Internal Affairs would be highly anticipated, but let me get a little tired of the last record first. It’s still relative fresh and new as far as I’m concerned. NFO has a lot more ‘pop’ on the new album; with tracks like “Turn To Miami” and “Sometimes The World Ain’t Enough” being evidence of that. While the band still rocks, there’s even more of a ‘musical stew’ on the new effort. NFO retained their great hooks, memorable choruses and catchy melodies and now dumped a helping of 80s ‘Euro-pop’ to the mix. Tracks like “Lovers In The Rain” and “Moments Of Thunder” are more to my liking; NFO went a bit over the top on the track “The Last Of The Independent Romantics” which at close to 10 minutes gets a bit monotonous. As it turns out, as I found out by doing research, some of the tracks or origins of these tracks dated back to Amber Galactic or predated it, so the cause for concern was for naught [or was it?]. The truth is very few bands are capable of delivering a retro sounding album that is genuine but THE NIGHT FLIGHT ORCHESTRA have done just that once again, though I would place this album right below Amber Galactic.